We all know who Gordon Ramsay is, or at least we think we do, it's much more likely we are familiar with a character generated for television than the real Gordon. One thing is that with a vast corporate group and TV career, it's not exactly clear how much influence he has even at his eponymous restaurant. There are definitely some Ramsay classics on offer, and I guess he must be aware of suppliers, inspiration behind the menus and the design of the rooms, but what is clear is his skill in choosing the right people to run an important flagship venue. Indeed this is the keystone of his empire, as the esteem of having 3 Michelin Stars under his belt is an essential part of his audience generating power. The restaurant in Royal Hospital Road has undergone some changes recently, the front of house has been refurbished and more importantly a shift has been made in highlighting the considerable talents of the head chef, Clare Smyth, who has overseen a change of menus, including a vegetarian menu, something I had not noticed on the website before the recent changes. We arrive on a wet Tuesday morning to a warm welcome, and were immediately seated. The room is luxuriously decorated in a neutral but pleasing colours, and surprisingly small, I believe just over a dozen tables are available. The lighting was better than the photo's indicate, the spot lights not the best for a mobile phone camera. We order a glass of rather fine Billecart-Salmon Brut Rosé Champagne, and are brought the menus, with the staff being well aware of my wife requiring the vegetarian menus. A choice of a la carte, set lunch or tasting menus are available, with the vegetarian menu offered in parts as a la carte, or in its entirety as a tasting menu. The maitre d', the charming Jean-Claude Breton introduced himself and explained the menus, and after we had made our choices the sommelier arrived to recommend a matching glass of wine with our courses. Jean-Claude runs an excellent team, the service throughout lunch was top notch, every move carefully choreographed down to a tee. 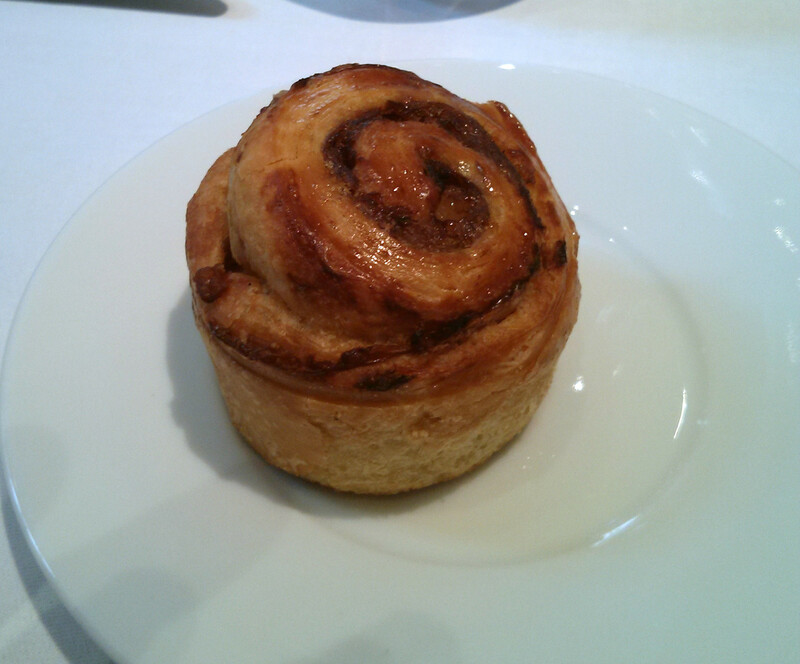 Bread was fantastic, a choice of bacon and onion brioche, a white sourdough, a wheatgerm and a white glazed roll of sorts. I chose the brioche and sourdough, my wife the sourdough and the roll. 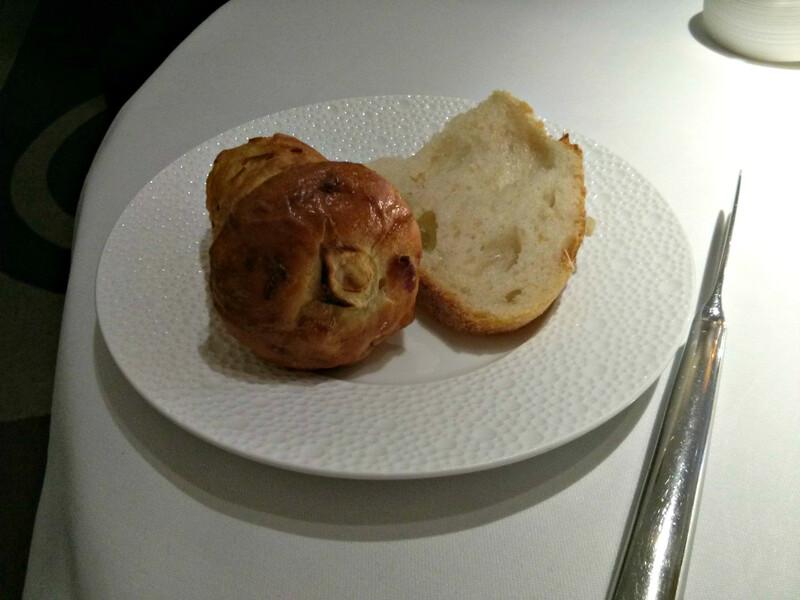 The sourdough was truly excellent, as good as the one at Hedone, and the brioche matching it by being as close to perfect as one can imagine, having a huge depth of onion and bacon flavour, and was unbelievably light. The amuse bouche was a glass dish with ricotta, pea and mint mousse, in these were set some tiny vegetables and flower petals to resemble a garden, and was as delicious as it was pretty. 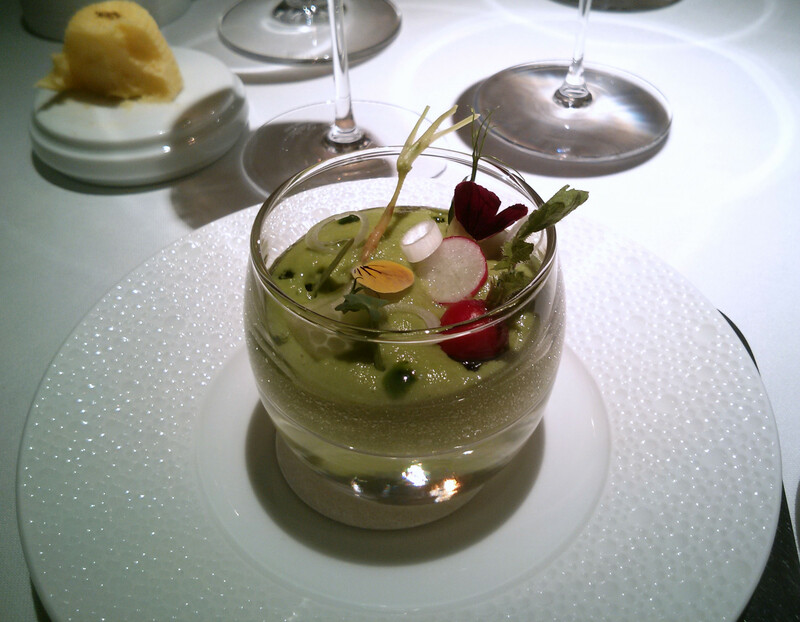 The mousse held excellent flavour, and restaurant obviously sources the best vegetables it can, with the tiny radish tasting lovely. We were recommended a glass of Condrieu ‘Les Vallins’, domaine Blanc Christophe for our starters. 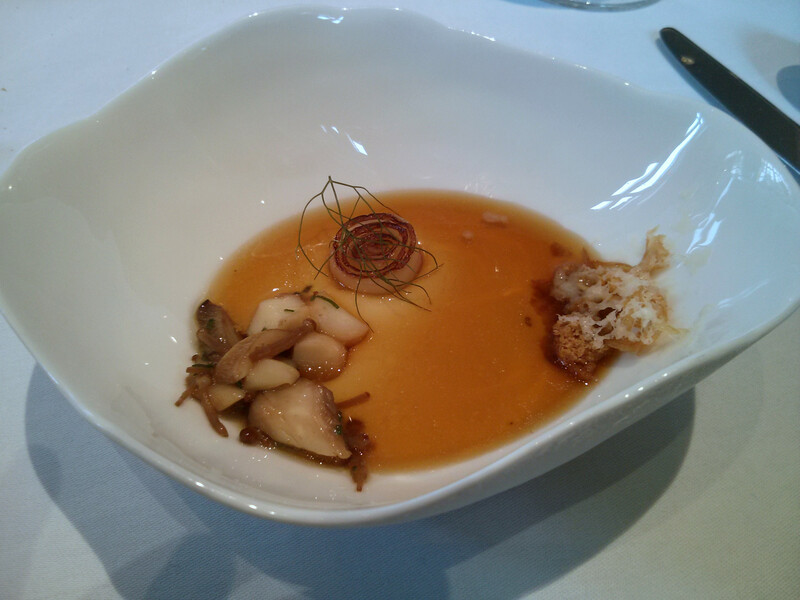 and coral vinaigrette. 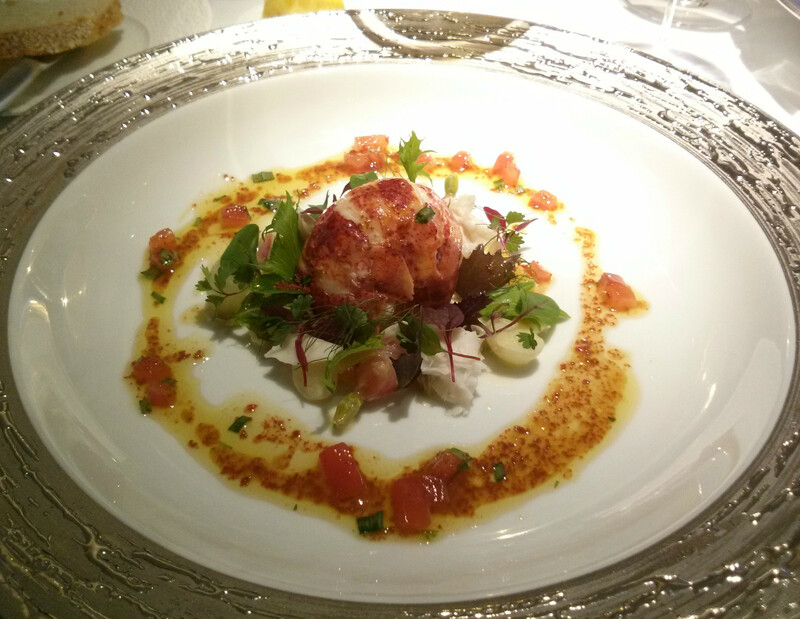 The lobster was of good size, cooked perfectly, soft and flavourful. Each mouthful was raised by a sliver of rich lardo, the crunch of the lilliputian carrots, radishes and artichokes, each beautifully prepared and lightly pickled, and the fragrant tarragon rich coral vinaigrette. 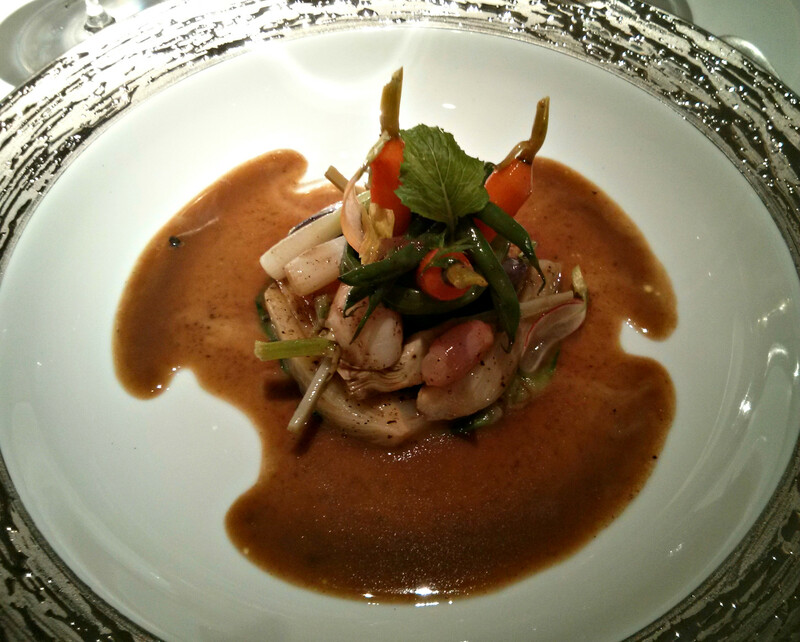 My wife's starter was a Assiette of spring vegetables braised en cocotte with Périgord truffle. Again some supreme vegetables were in evidence, tiny carrots, purple new potatoes, beans, spring onions, radishes and turnips in a pretty presentation, with the truffle sauce being added at the table. These were absolutely exquisite vegetables, buttery and full of flavour, with the truffle sauce adding an earthy element. My main was a stunning suckling pig dish, a selection of cuts from nose to toe, slices of moist loin on a bed of potatoes and spring onions, a fabulous sausage, a brilliantly cooked square of crisp and sticky pork belly, a vibrant green cabbage leaf stuffed with jowl, rich and savoury and a hunk of gammon hock complete with tiny pineapple ring. 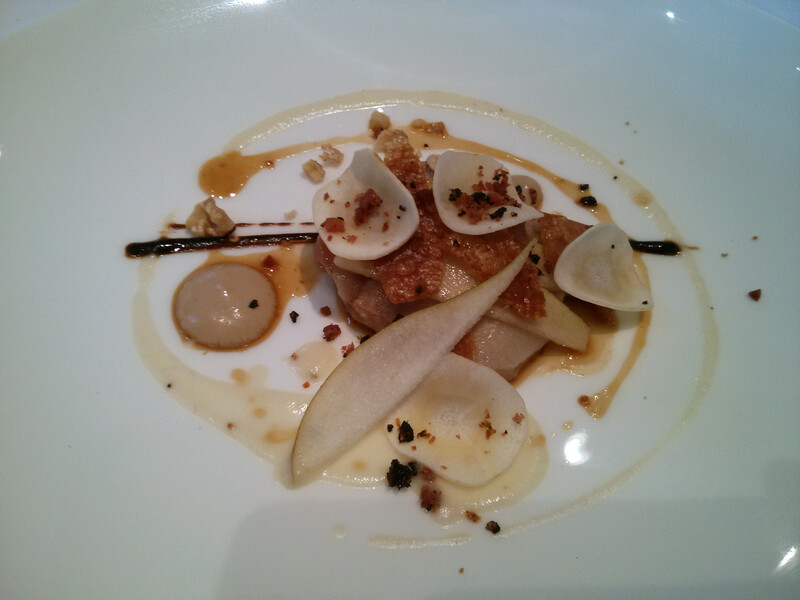 To balance this some gorgeous pieces of apple, raw and cooked, a velvety apple puree and awesome jus. 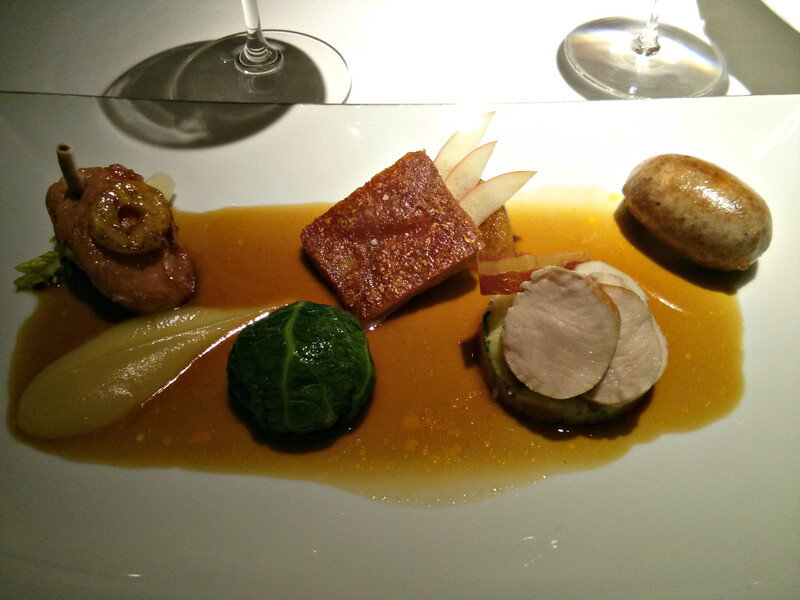 This was one of the finest pork dishes I have ever had and one of the best main courses I can remember. 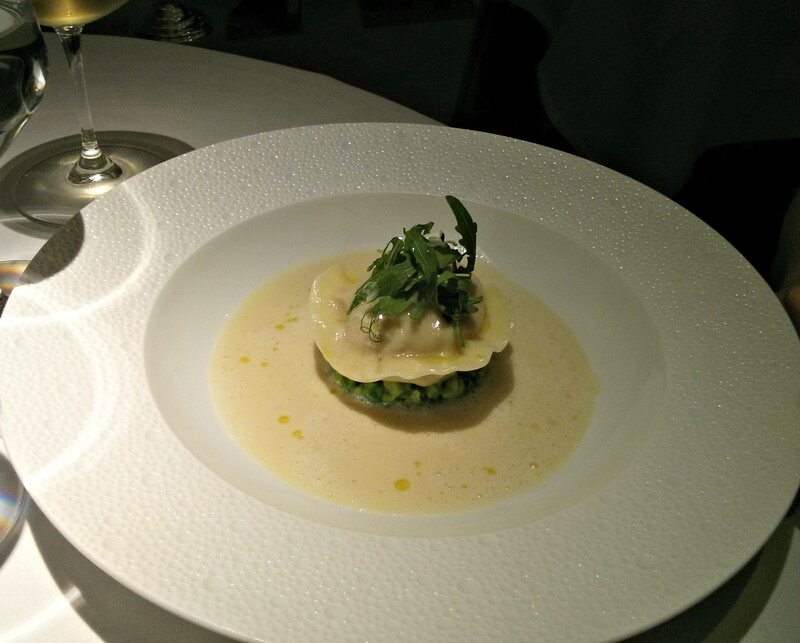 My wife's main was a really well executed ravioli, containing a poached egg and smoked potato, on a bed of broad beans, with a generous serving of parmesan sauce being applied at the table. 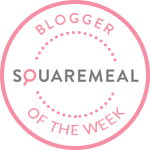 This too ranked as one of her best dishes in a long time, with the sticky yolk, umami rich parmesan and smokiness of the rich, buttery mash being a perfect match. For my main I had a glass of Kéfrankos from Sopron in Hungary, and my wife another glass of the Condrieu. 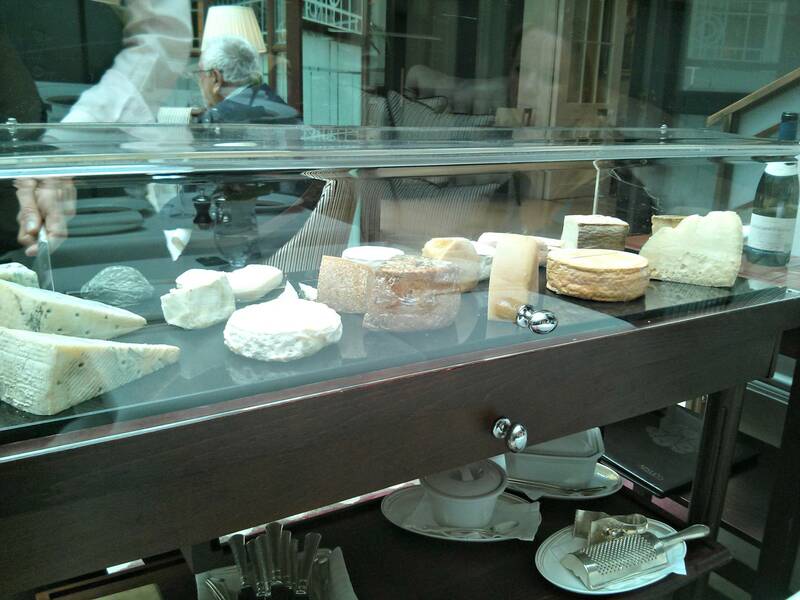 Having walked past a fully loaded cheese trolley with a host of excellent choices, I couldn't resist sharing a plate. The standouts were a Scottish Cashel Blue and a Pouligny-Saint-Pierre. What must be mentioned were some stunning accompaniments, some amazing grapes with a fragrant rose flavour, a great fruit and nut bread, some cheese crispbreads, and fantastic little oat cakes. Pre-dessert was a glass of passion fruit soup topped with a yoghurt foam, this was drunk through a large glass straw and was a perfect palate cleanser, clean, sharp and refreshing. 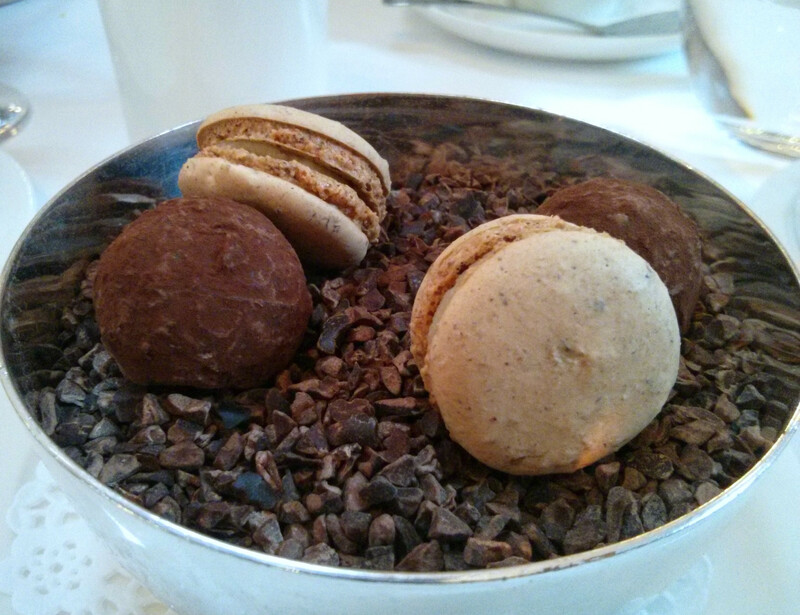 Unusually, we chose desserts at the start of lunch. We didn't have to, but they wanted notice if we were to have the Tarte Tatin and souffle. However, having seen pictures elsewhere, I thought we should share the Assiette de l'Aubergine, as I thought this was a plate with 3 miniature desserts. What we actually got was a fantastic surprise, you know when you have a menu and all the desserts sound great and you can't decide what to have? Well Gordon realised this, and solved this problem with a genius solution, by just giving you one of everything. 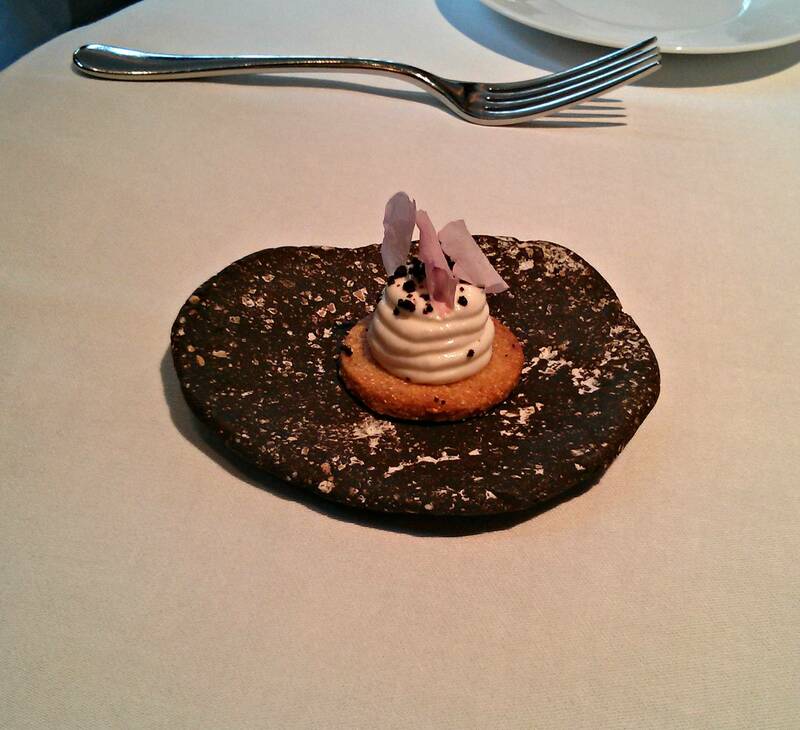 At first a large plate was placed on table holding the lemonade parfait, bitter chocolate cylinder and blackcurrant, fennel and yoghurt genoise, this was followed by a miniature tarte tatin. 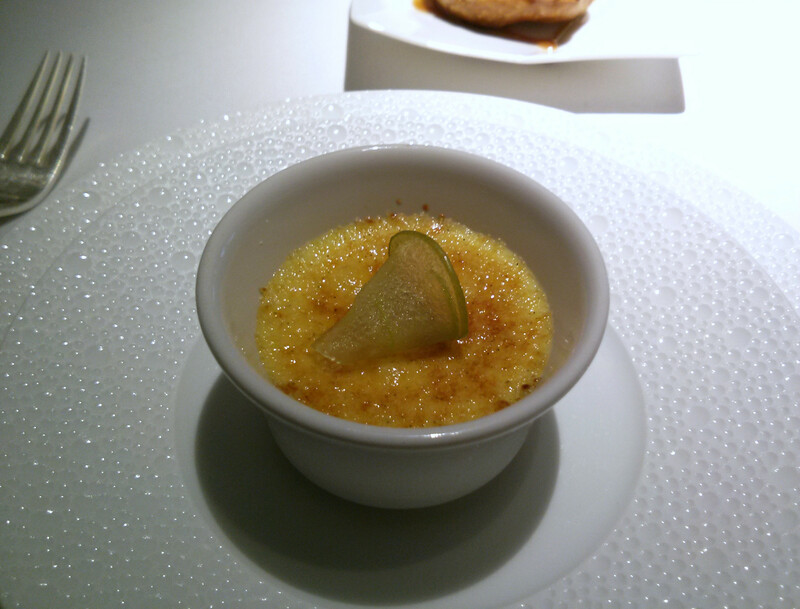 Two small creme brulee's were then placed in front of us, these were excellent, with a base of agen prunes, some quality vanilla in the creme and a thin slice of crystalised lime on top. As soon as finished these and we were contemplating how to start on the remainder, some space was cleared and a coconut souffle was added! 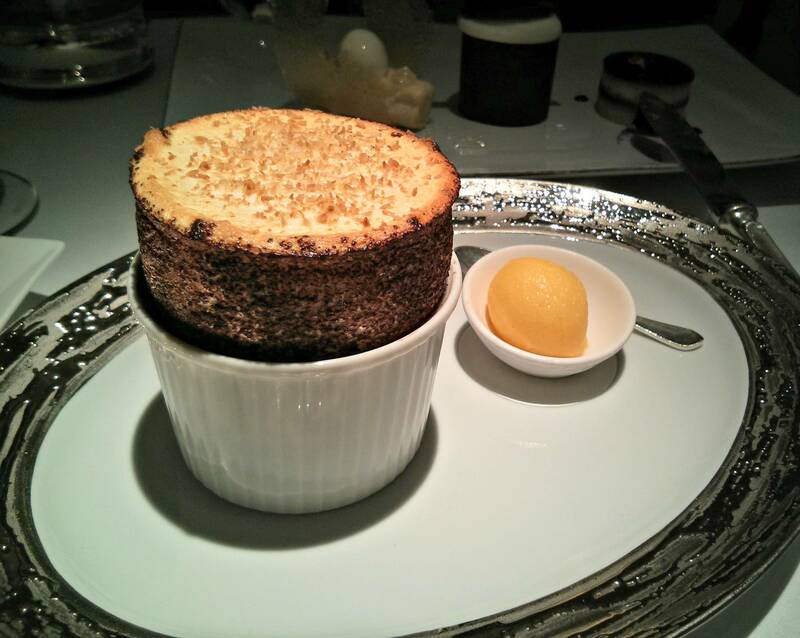 We started on the souffle, this was absolutely top class, with rising high, technically perfect with an excellent coconut flavour, it came with a terrific lime and mandarin sorbet to cut through the sweetness. 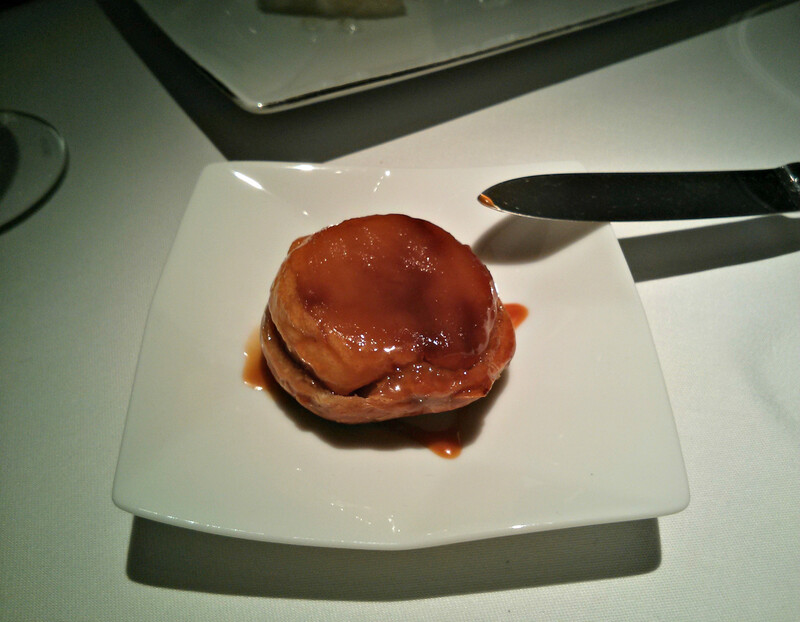 The tarte tatin has been a regular on the menu since the restaurant opened, and had an excellent blend of butter, caramel and apple. We tried the lemonade parfait next, it was delicious, and definitely captured lemonade flavours rather than just lemon, with it's ring of spun honey a technical marvel and would have been a perfect choice if we only had to have one. The blackcurrant, yoghurt and fennel genoise was soft and light, and more subtle the violet sugar underneath adding another dimension. Finally we split the chocolate cylinder, which featured bitter chocolate, a light mousse and a particularly nice ginger flavoured mousse and caramel. Every single dish in the assiette was superb, and as a whole one of the most generous desserts I've ever had, we were laughing and joking at the sheer number of plates on the table. 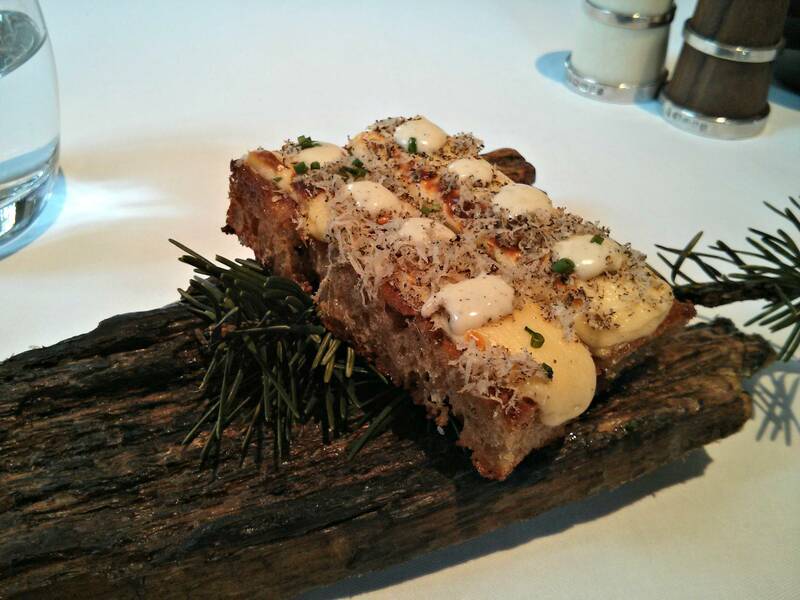 I might suggest skipping the cheese course if you have ordered this! I recommend this to anyone who likes their puddings to go out of their way to try, you won't get any better anywhere. Coffee arrived with mignardise, one a staple of the restaurant, a theatrical dish streaming smoke from dry ice containing some lovely white chocolate truffles with strawberry ice cream centres, mint chocolate ganache's impaled on tiny silver trowels to keep fingers clean, a nifty invention I've not seen before and some light, almost translucent rose turkish delights. The bill came to £360, at the upper end of what you will pay in London, although well justified as our lunch exceeded my expectations. 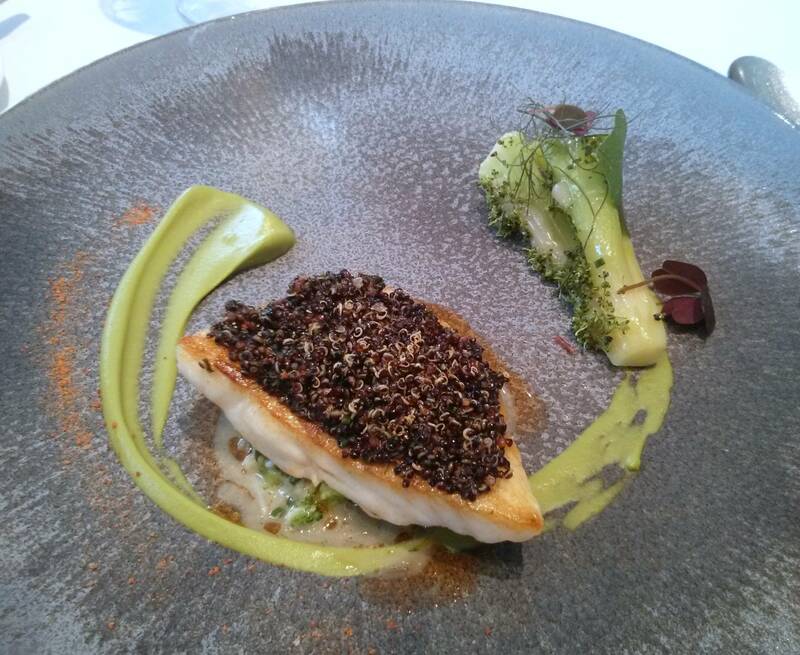 Although I knew it would be excellent 3 star food and service, and I knew that Clare Smyth is one of the finest chefs around, I didn't realise just how good everything would be. I guess lack of buzz on food forums and blogs and it's absence from the lists of the current popular modernist restaurants, with their fancy techniques and foraging had influenced me a little. I am glad to have been proven otherwise. 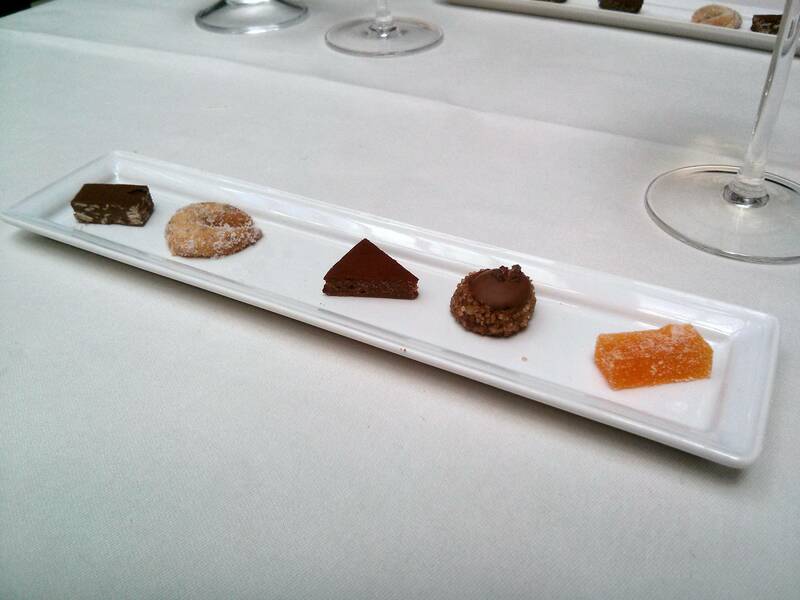 Every element of the meal featured the finest you could have, right down to accompaniments with the cheese course. 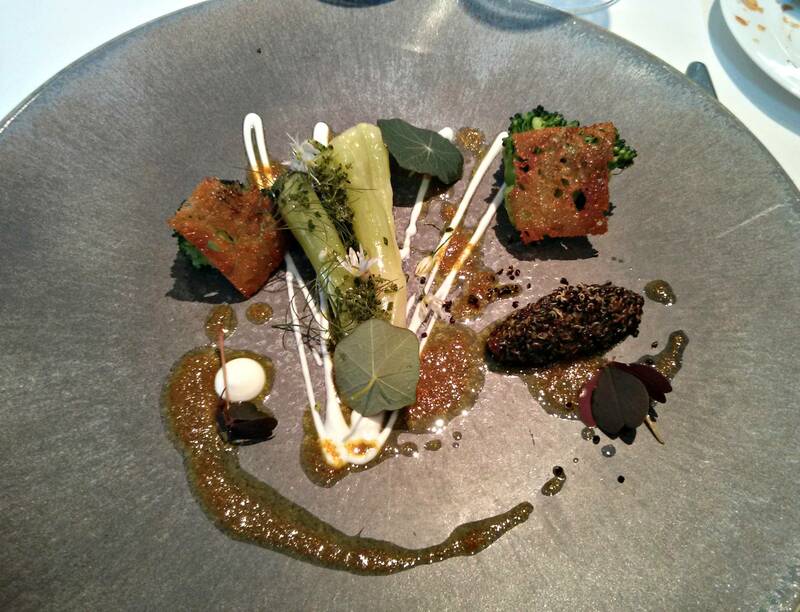 With a sophisticated and thoughtful vegetarian menu, some brilliant starters and main courses and the pudding to end all puddings, the meal and service was a perfect example of what the very best that fine dining has to offer. Bacon and onion brioche, white sourdough. Amuse bouche of ricotta, pea and mint mousse. White chocolate and strawberry ice cream truffles. 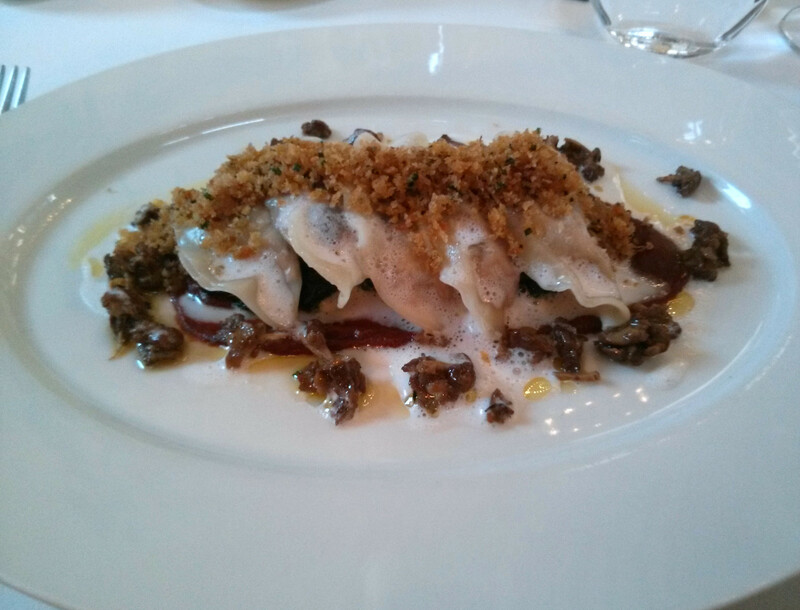 Due to it's proximity to my old office and one of our regular haunts, Spitalfields market, Galvin La Chapelle was one of our very first fine dining experiences when we celebrated our engagement a few years ago. We've also been to Cafe a Vin a number of times and have enjoyed some meals and snacks there. This Sunday we decided to return for lunch. Undoubtedly one of the best dining spaces in London, La Chapelle is a converted Victorian school chapel with a gorgeous wooden beamed roof, open bricked upper walls and on a bright morning provides a large well lit, airy space, with the sun beaming through the lovely arched windows, absolutely perfect for a spring lunch. La Chapelle has a reputation as a good family venue for Sunday lunch, and that was evident in the crowd on the day, a table of board games and toys was available for any children, along with a chicken and ice cream meal for £9.50. Also present were the Ray Rich Band, playing Jazz classics and modern songs, their loungecore cover of Daft Punk's Get Lucky was most amusing. Grazing on some of those shiny bright green olives and a glass of Pommery rose champagne, the initial idea that I was going to have the Sunday set lunch menu, was waylaid due to the a la carte menu being available, and I was able to try some of the dishes I missed on the previous visit. First course was a signature dish, Lasagne of Dorset Crab. 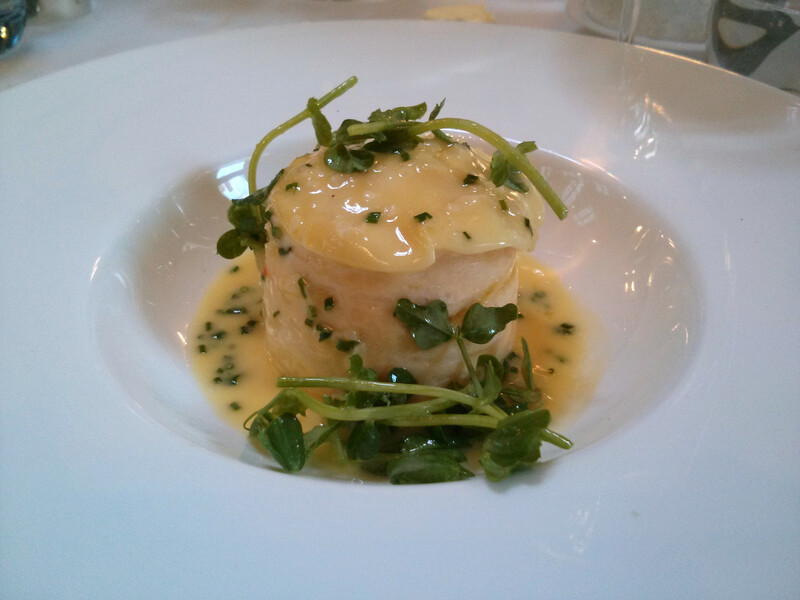 The lasagne was crab mousse sandwiched in between wafer thin sheets of pasta, and this was served with a beurre nantais and pea shoots. The crab mousse was incredibly light and well flavoured, the beurre nantais having an excellent kick of lemon with the sweet shallots and garden fresh pea shoots providing another well matched dimension to the dish. 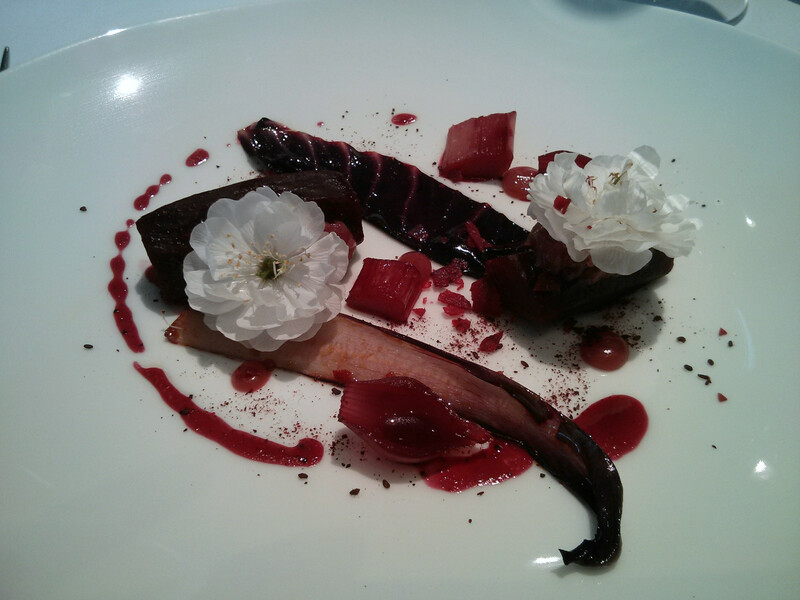 This was a superb dish. 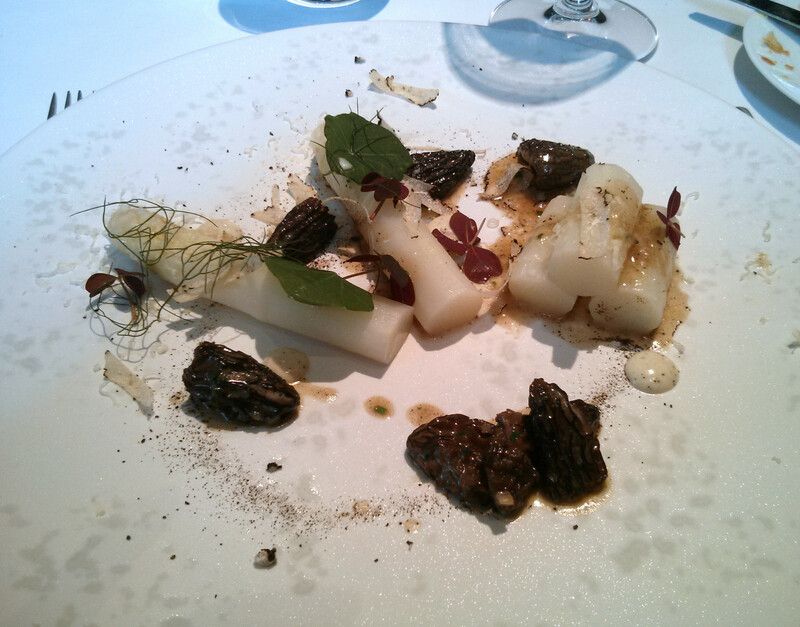 My wife's starter was a dish of white asparagus, truffle, truffle mayonnaise, morels and a poached egg. 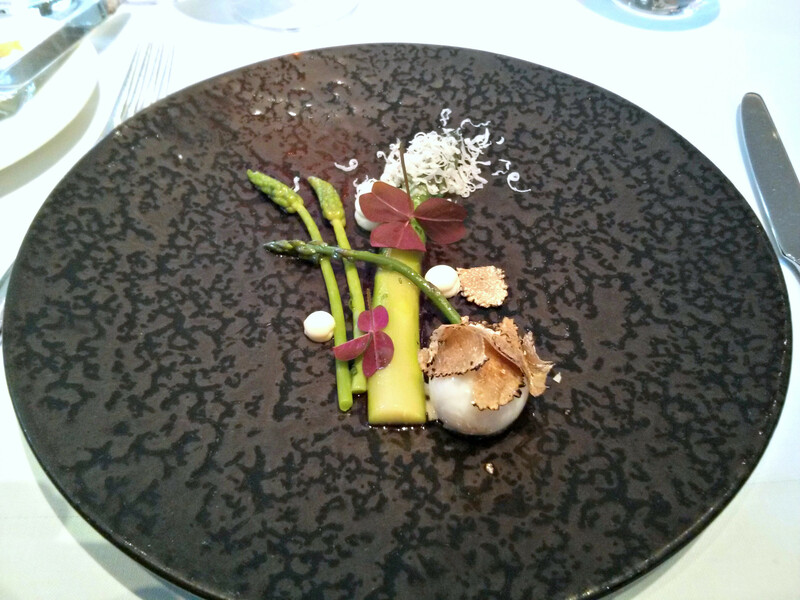 The asparagus and morels were of good quality, with the truffle element being noticeable, another good starter. 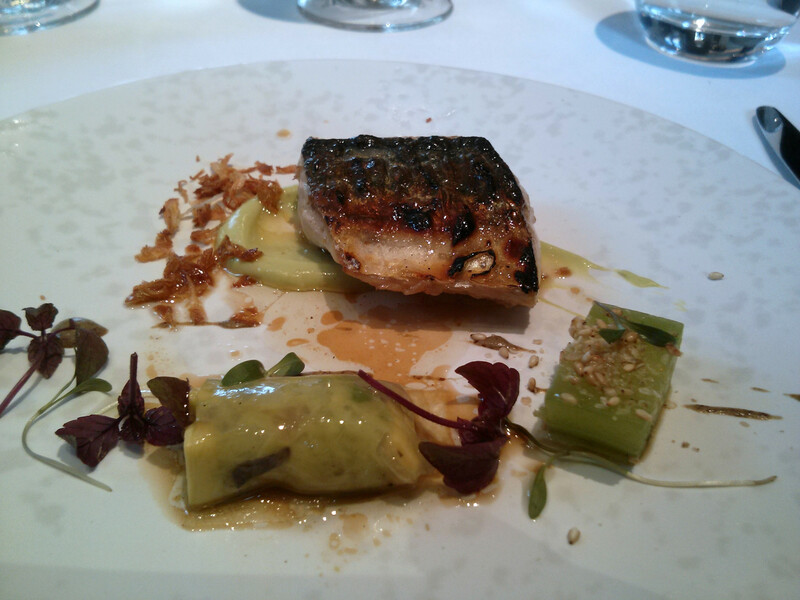 Accompanying the starter was a glass of 2011 Grüner Veltliner Selection, Weingut Rieden. 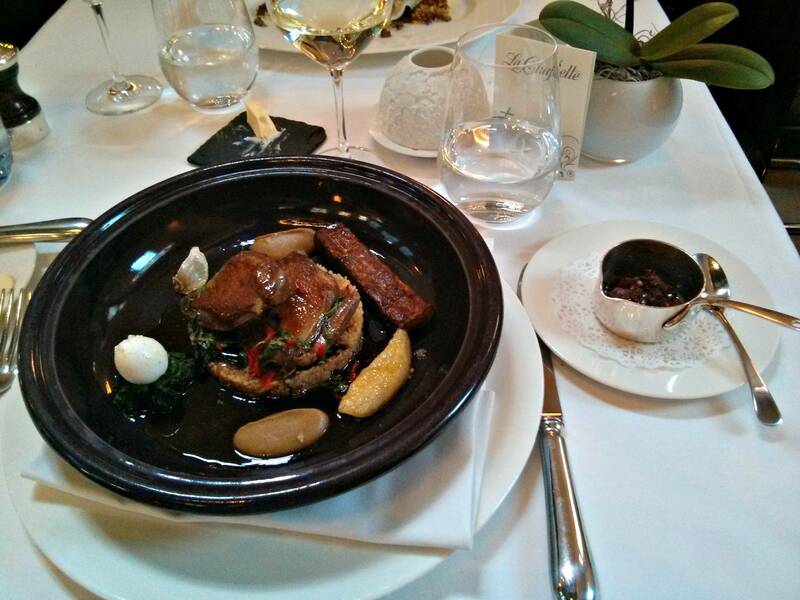 My main was another signature dish, the Tagine of Bresse Pigeon, couscous, confit lemon and harissa sauce. It was presented a large black tagine dish, and featured two pigeon elements, the breast and a wrap of crispy skin filled with the leg and wing meat, these came with couscous, aubergine puree, a quails egg on a bed of spinach and a pan of harissa sauce. 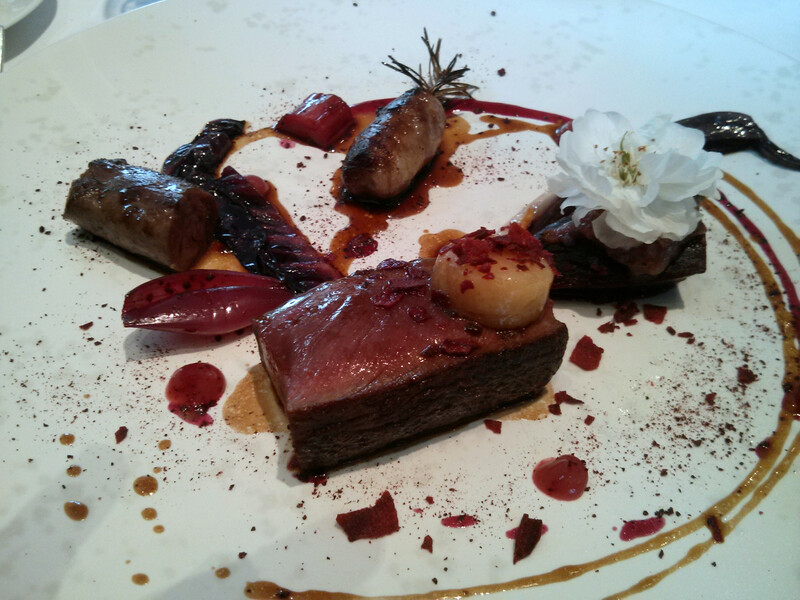 The Bresse pigeon was excellent, lovely breast meat served rare and the wrap of crisp skin and tasty leg meat a savoury and rich accompaniment. The harissa sauce was intense and I used it sparingly with the main dish to give a heated North African flavour. The couscous was particularly good, featuring golden raisins, almonds and slices of olive, one of the nicest examples of it's kind I've ever had. The confit lemon was a new one for me, it went perfectly with the meat and not a hint of bitterness but tons of sweet lemon flavour. This was a fabulous dish, a range of delicious elements and a whole brigade of flavours I wouldn't normally expect in a French restaurant. 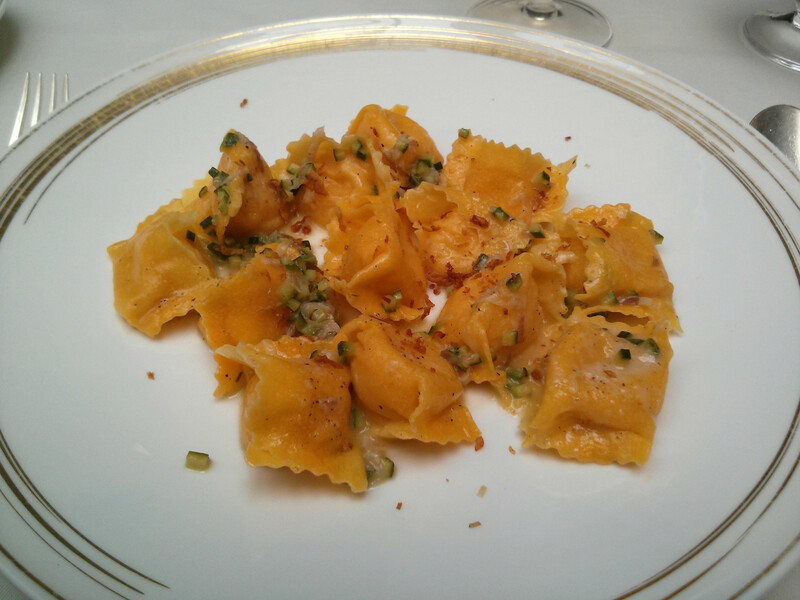 My wife's dish was Agnolotti of ricotta, capers, golden raisins, tomato fondue and parmesan. 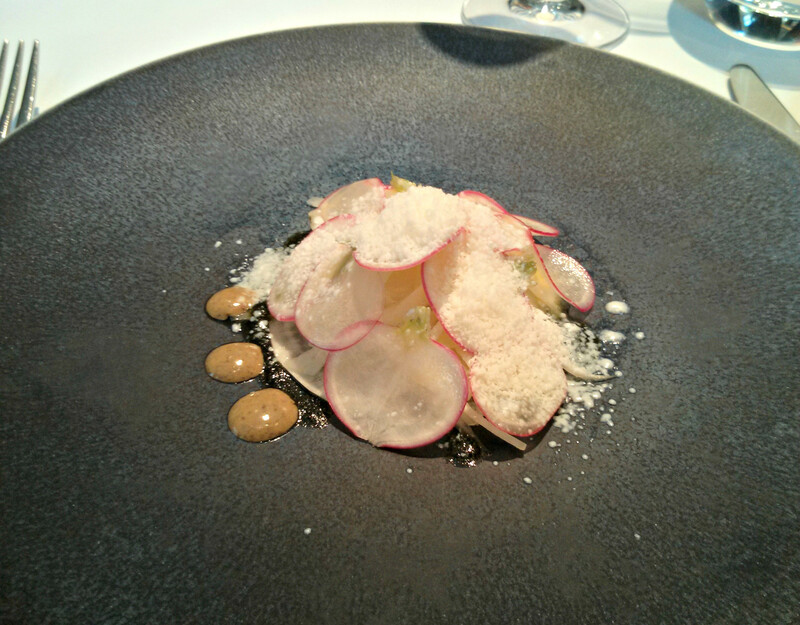 This was a sophisticated dish, the elements providing a huge depth of flavour that started sweet from the raisins and and finishing on a umami rich parmesan flavour. 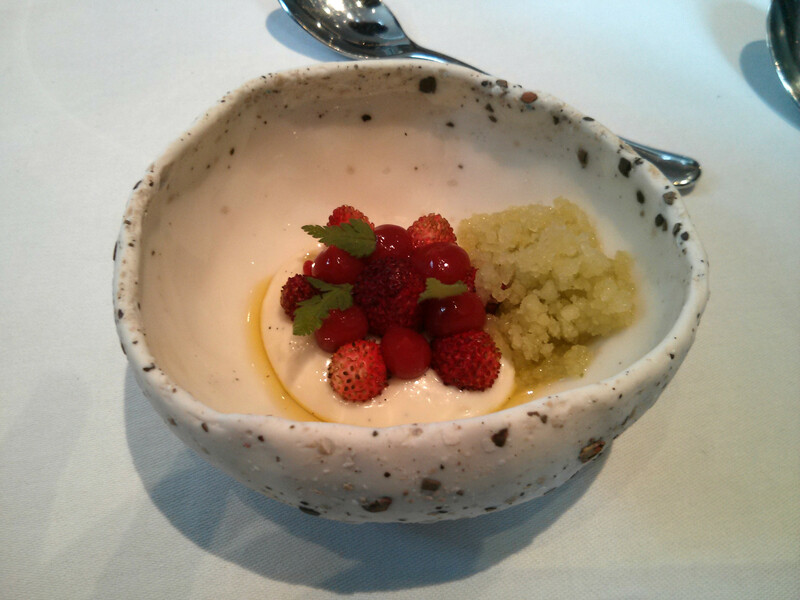 My dessert was Macerated gariguette strawberries, shortcake, marshmallow and lemon verbena ice cream. The strawberries were absolutely stunning, the nicest strawberries I've had a long time, perfumed and intense with flavour and even better than the wild strawberries I had recently. The shortbread was excellent, as were the strawberry marshmallows and ice cream. 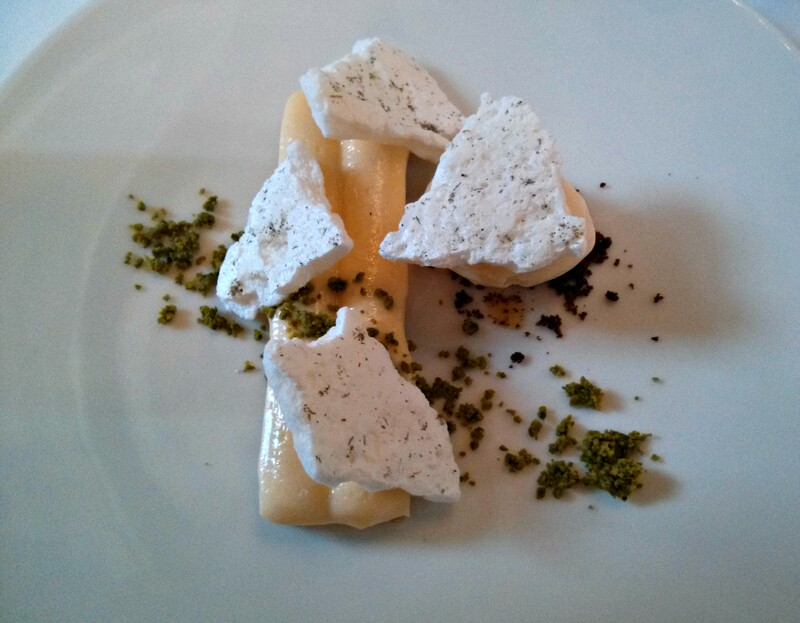 My wifes dessert was lemon curd on a pistachio sable, lavender meringues and a white chocolate ice cream. 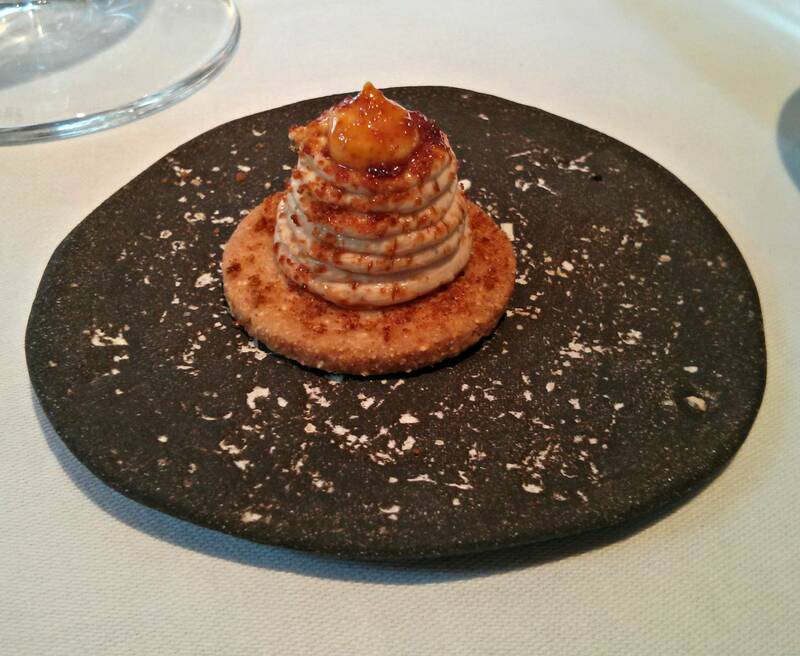 The biscuit, curd and meringue I tried were great, the tart curd balanced well against the sweet parts. Accompanying this was a glass of excellent Tokaji Aszu. 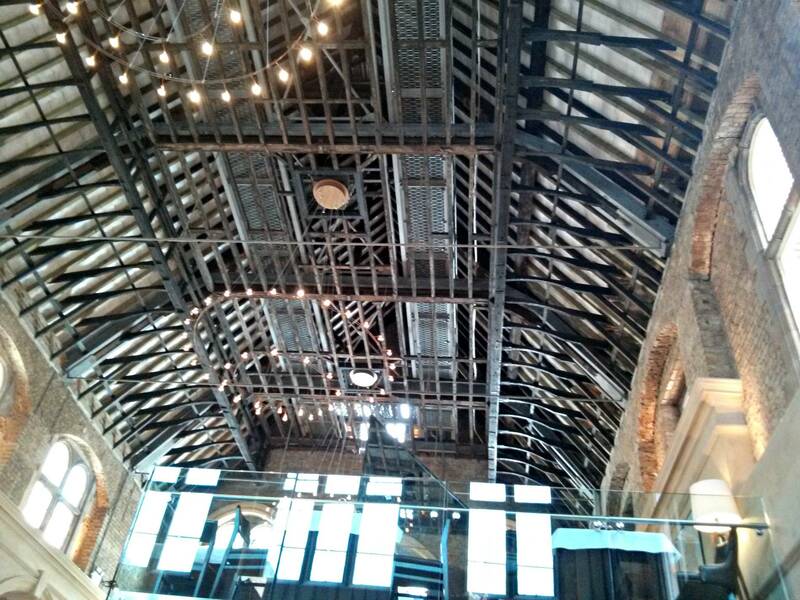 We will definitely return for the Sunday lunch on our next visit to Spitalfields and Brick Lane markets. I'm eager to try one of the roasts cooked to this standard too. Service was friendly and efficient, and the although the bill came to £207, this was the a la carte menu, our next visit we will try the Sunday lunch menu, at £29.50 (£38.50 will get you half a bottle too), this is a good price for a Sunday lunch featuring some excellent food, a superb room and some live music. Lasagne of Dorset Crab, beurre nantais, pea shoots. 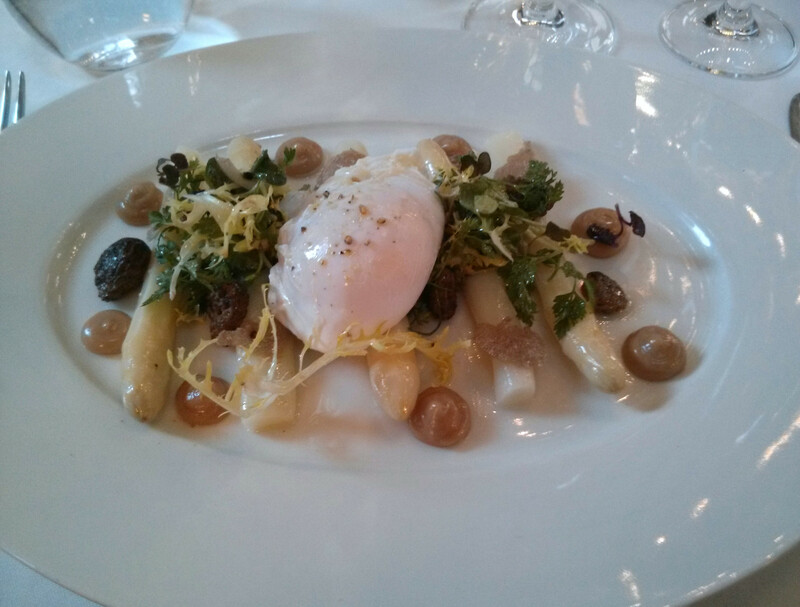 Chilled white asparagus, poached egg, truffle. Tagine of Bresse pigeon, aubergine, cous cous, confit lemon & harissa sauce. Agnolotti of ricotta, capers, golden raisins, pine nuts, tomato fondue & parmesan. 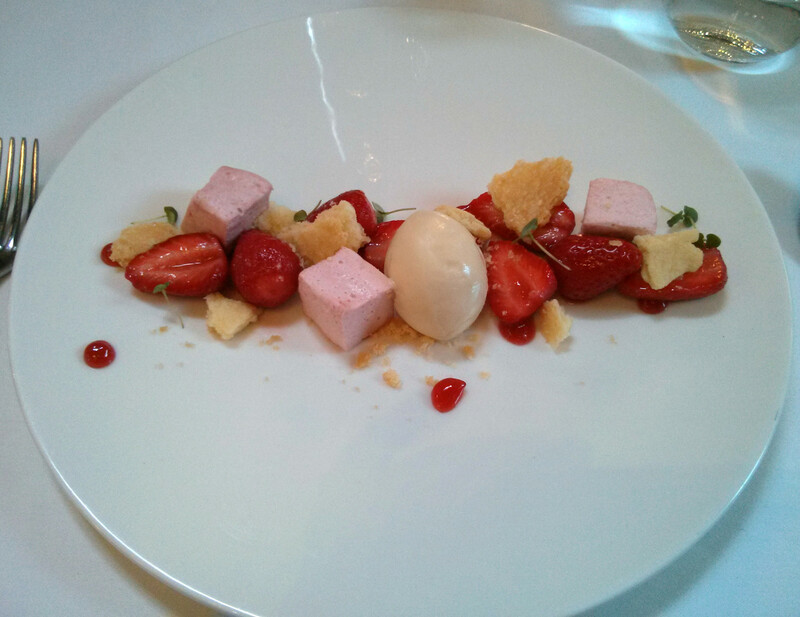 Macerated Gariguette strawberries, strawberry marshmallow, shortbread, lemon verbena ice cream, basil. Lemon curd, pistachio sable, lavender meringue & white chocolate ice cream. The Lanesborough and Apsleys are currently shut for renovation. 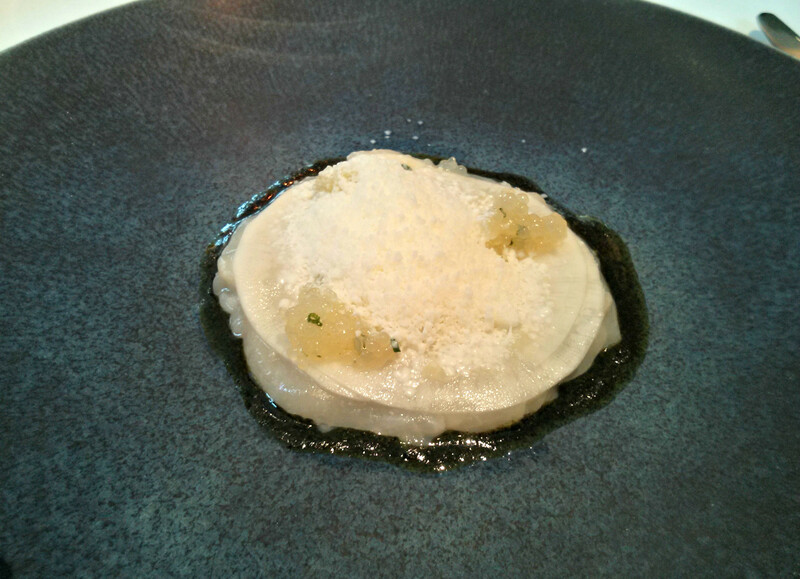 Apsleys is the London outpost of Heinz Beck, whose 3 star La Pergola in Rome is of some renown. Based at The Lanesborough, it's a beautiful space, especially welcoming for our spring lunch due to a huge skylight flooding the room with a warm light. The kitchen is headed up by Heros De Agostinis. Starting with a glass of Franciacorta we chose from both the a la carte and set lunch menu, with a choice of 4 vegetarian dishes across both menus for my wife. 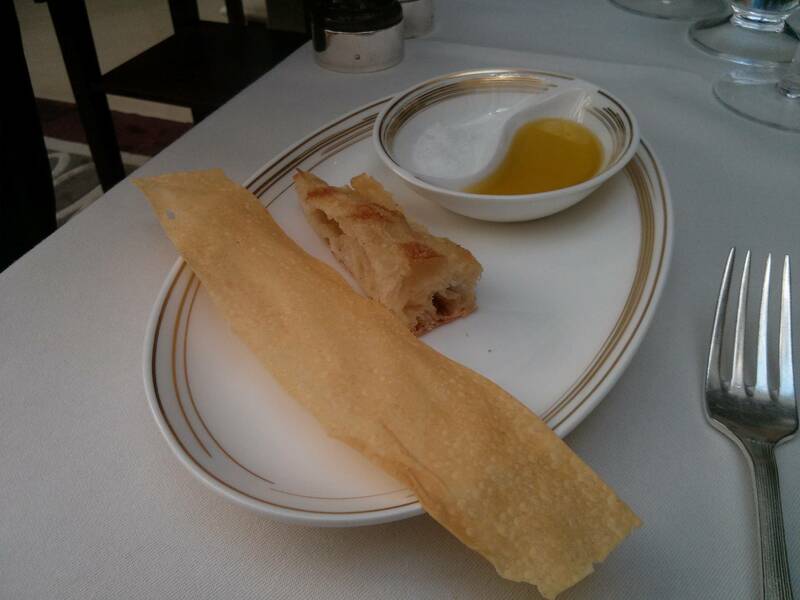 Bread was served with a dish divided between flakes of salt and a good olive oil. 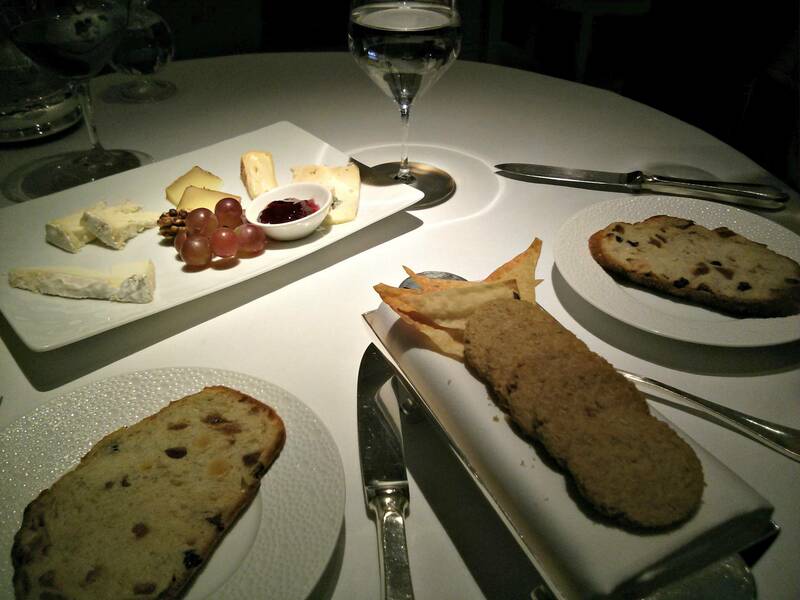 I tried a crisp wafer, ciabatta, sourdough and olive over the meal, and all were excellent. 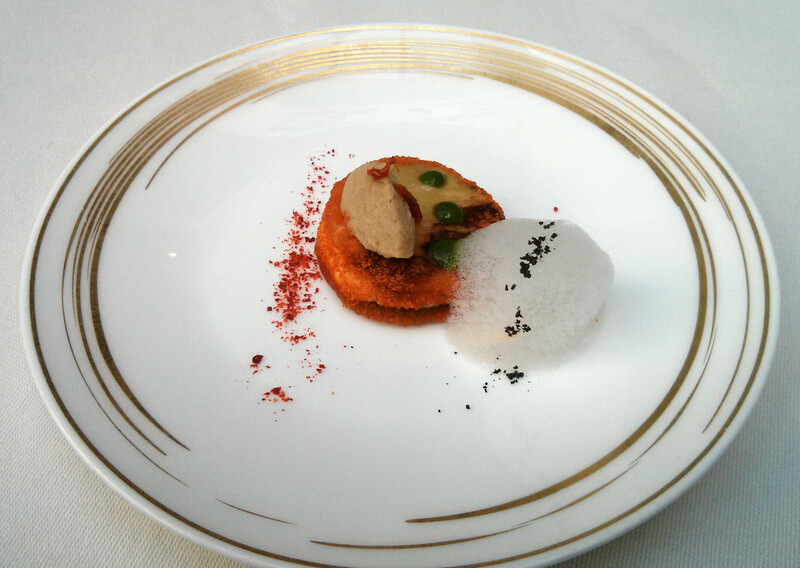 An aubergine based amuse bouche was a good start with a respectable depth of flavour to the aubergine and tomato, with the foam and dressing adding a refreshing Mediterranean taste. I had a glass of Planeta Chardonnay and my wife a glass of Niedrist Sauvignon Blanc. First course for me was the signature dish of Fagotelli Carbonara, a superb pasta holding a liquid mixture of cured pork cheeks, pecorino, cream and butter. This was truly outstanding, an explosion of liquid, redolent with the essence of carbonara fills the mouth when bitten, an absolute joy, definitely a world class dish. For my wife, a gorgeous bowl with fried taleggio ravioli, crispy rice with a vibrant tomato puree into which pea soup was poured. The pea soup was of the highest quality with a very fresh and intense pea flavour and matched with the crispy cheese bites really well. 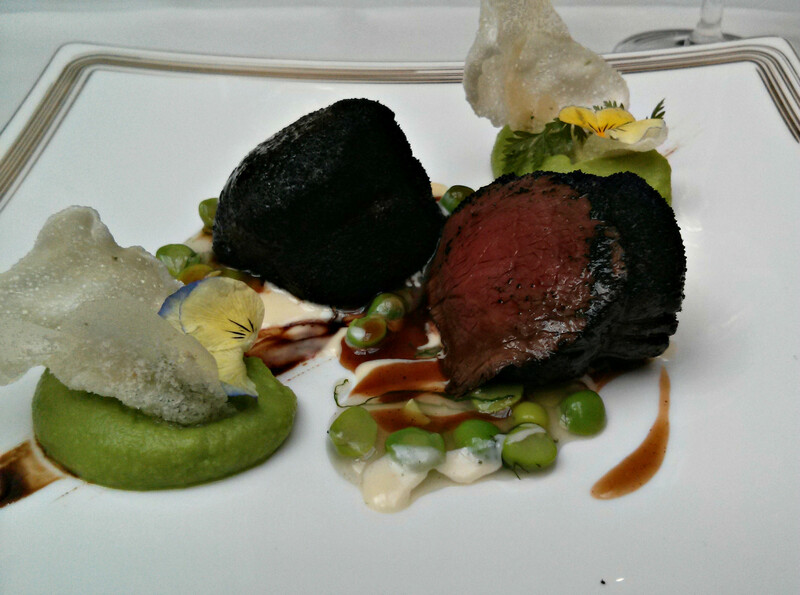 Main for me was a lovely piece of Casterbridge beef, and luckily for me this was served with the great peas used for the soup, both pureed and whole, some broad beans, some parmesan crisps, a jus and balsamic vinegar. I really enjoyed this, and had just enough subtle touches to ensure it kept some Italian flavours. 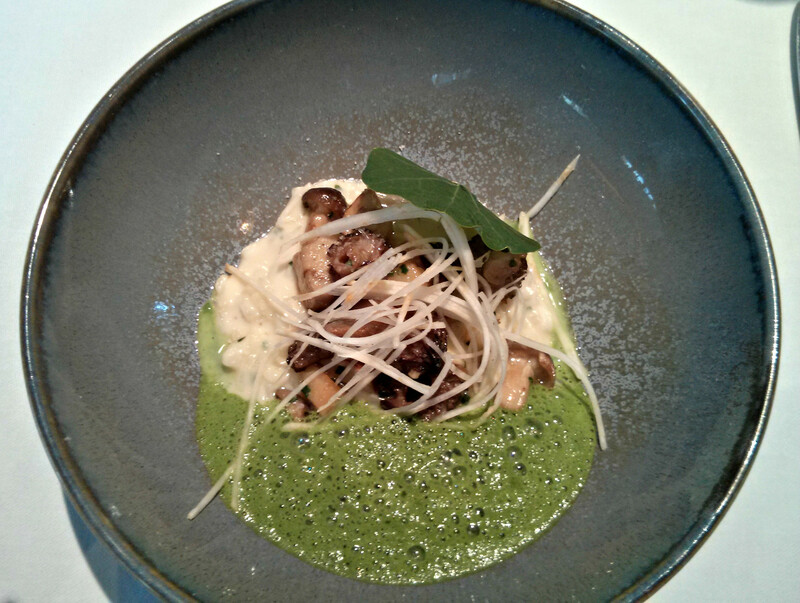 For my wife, “Cacio e pepe” gnocchi with wild mushrooms and baby carrot foam. 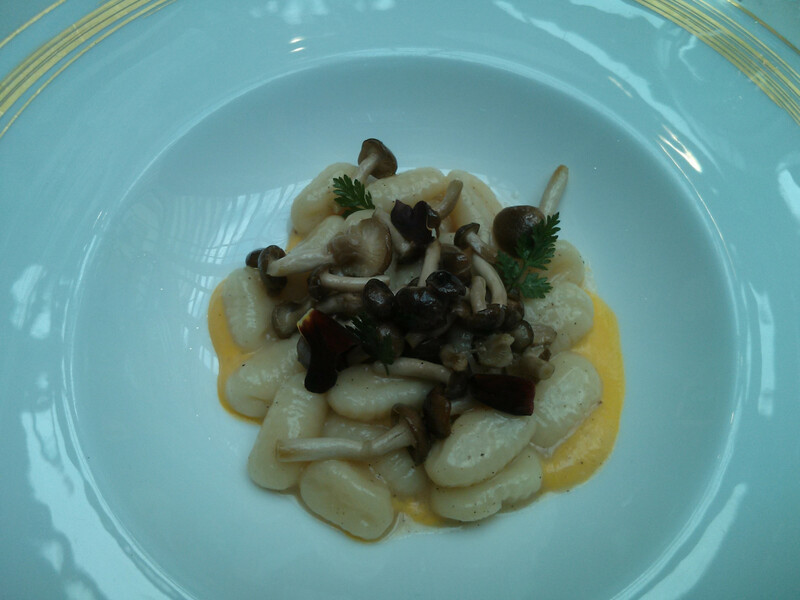 These were fantastic gnocchi, with some exceptional mushrooms and seasoned perfectly. The sauce was rich with butter, and highly indulgent. We shared a plate of cheese, with a good selection of cheeses, 2 creamy Italian cheese, a brie of sorts, an excellent harder cheese, possibly pecorino and 2 fabulous blue cheeses. These came with some awesome little fennel biscuits. I couldn't resist a glass of Chateau Climens Barsac to go with dessert, one of my favourites. 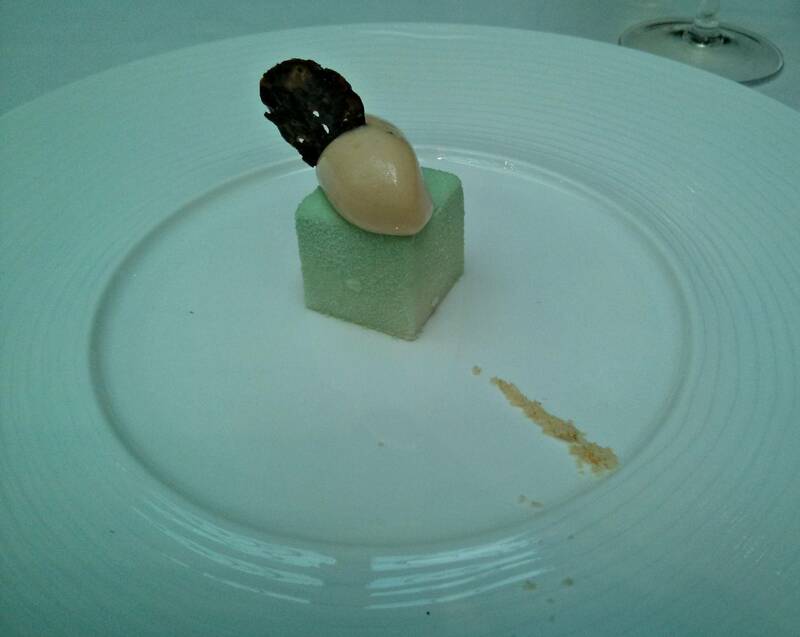 Pre-dessert was a chocolate crisp and banana caramel ice cream, with a pistachio crust around a cheesecake centre. This was an enjoyable mouthful, the ice cream in particular being well flavoured. The main dessert was possibly one of the most spectacular and delicious desserts I have had in a long time, Chocolate and vanilla sphere with a raspberry heart. 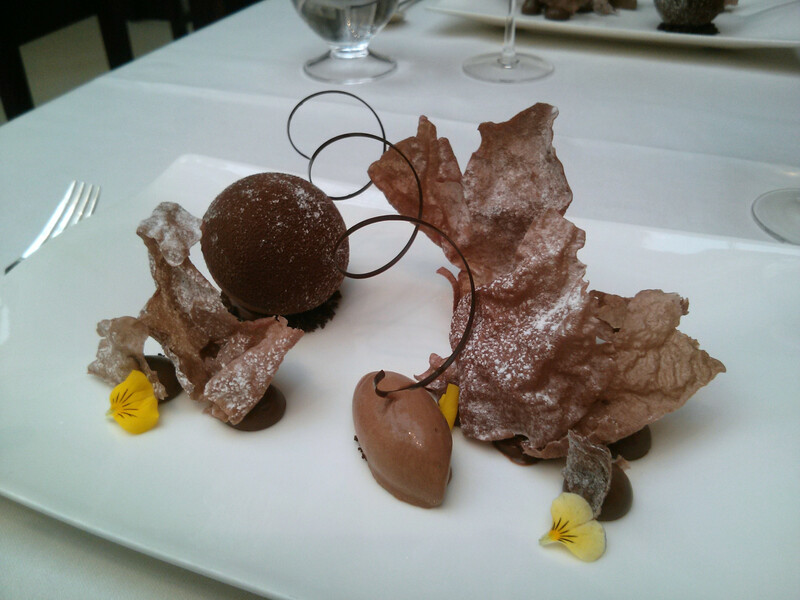 A sphere of dusted chocolate rested on a bed of crumbs, when broken you discover an vanilla semifreddo, and best still in the centre of semifreddo were rectangular pillows of chocolate, one for each side of the sphere, which turned out to be wafer thin shells surrounding a raspberry coulis of the highest quality. 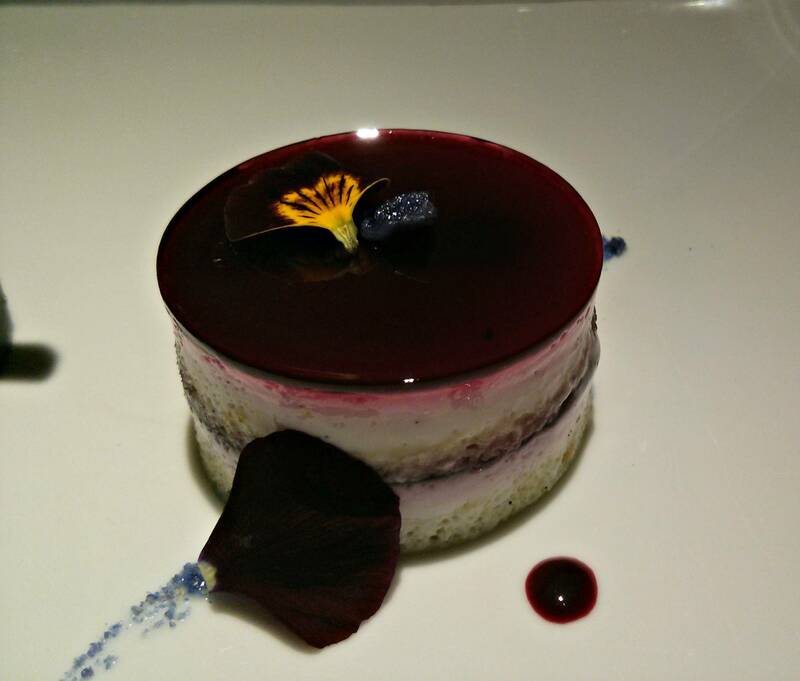 The raspberry went so well with the chocolate and semifreddo, perfectly balanced. 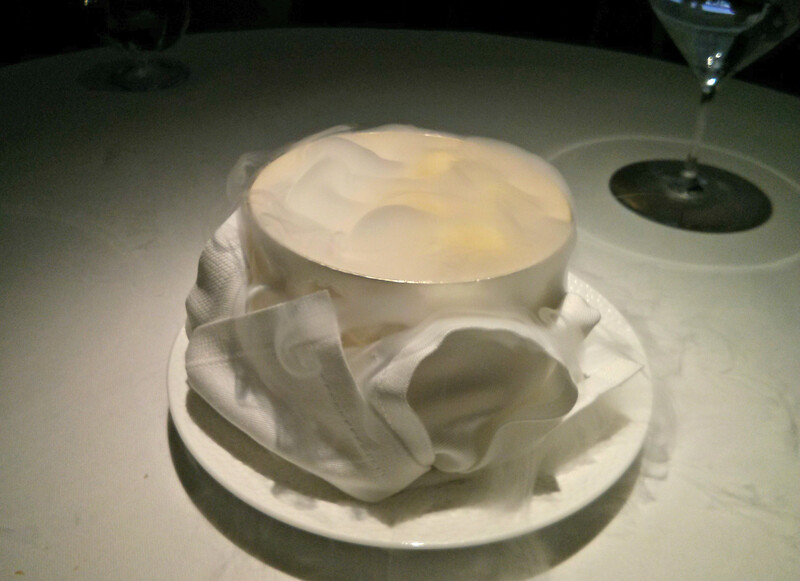 If that wasn't enough, it was accompanied with huge micro-thin sheets of wafer, which even though barely had any substance at all held an exceptional rice and chocolate flavour. 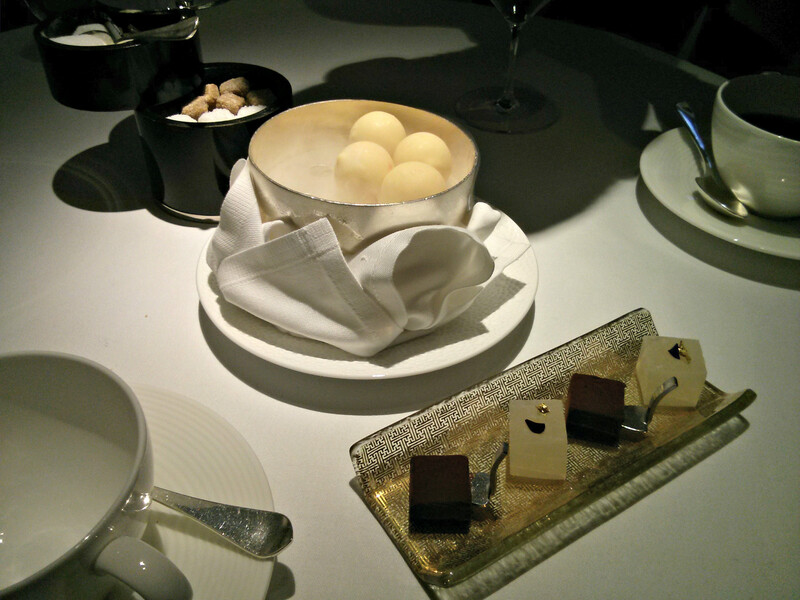 These were rested in pipings of a fabulous mousse, and with this was also a chocolate sorbet and coil of chocolate. This not only displayed the highest quality technical skills, but the elements each had their own distinct flavours. 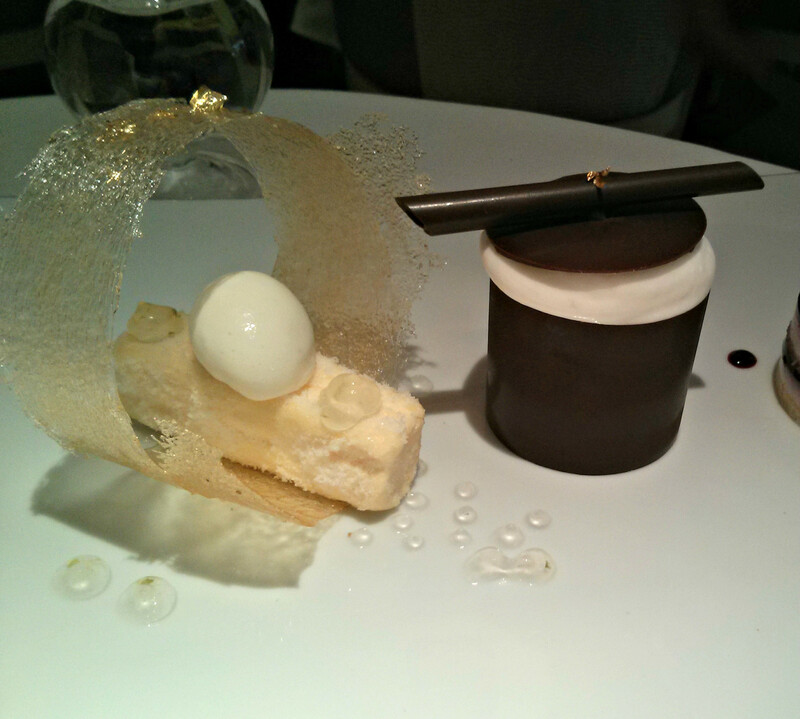 Every part of this was perfect, a fabulous and memorable dessert and a creation of the highest quality. A large pot of some excellent coffee accompanied a selection of petit four, some chocolates, biscuits and a passion fruit jelly. These were lovely, and another tribute to the skills of Apsleys pastry section. The bill came to £230. 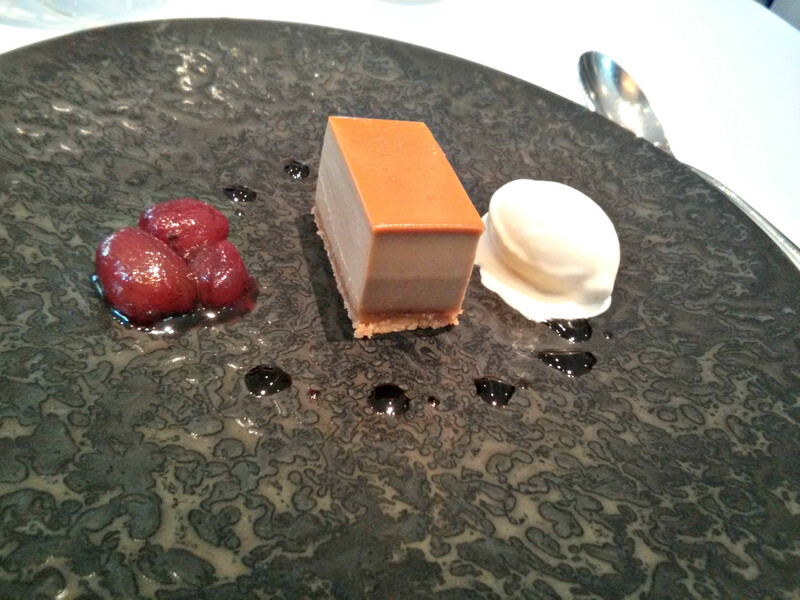 I really enjoyed Apsleys, an outstanding Italian restaurant with few rivals of its ilk to match it in London. 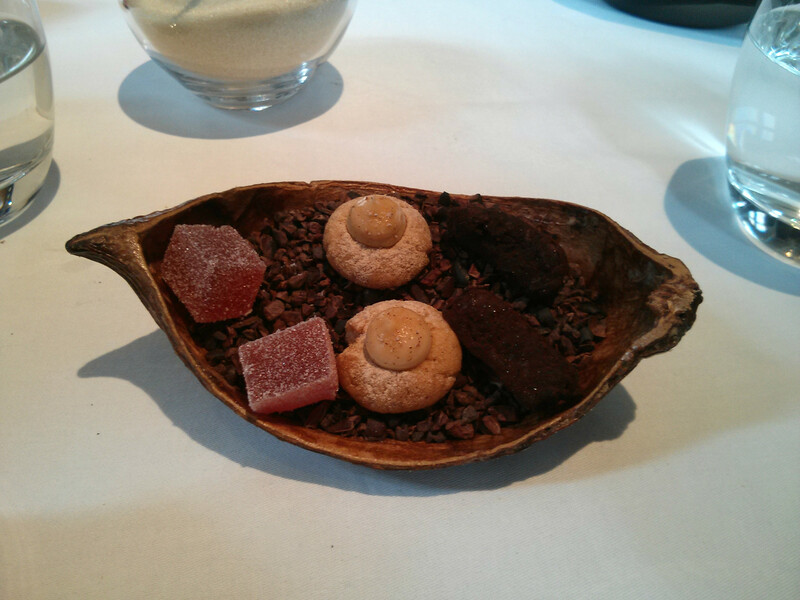 We had some fantastic dishes, the Fagotelli dish and dessert were simply awesome. The room was lovely, service was good, although we had to ask for the A La Carte menu, having only being given the set lunch menu, not sure why both weren't offered as they were to the other tables, I wasn't that scruffy ;) That minor detail won't stop me going back, as there were a number of great sounding dishes on the menu. 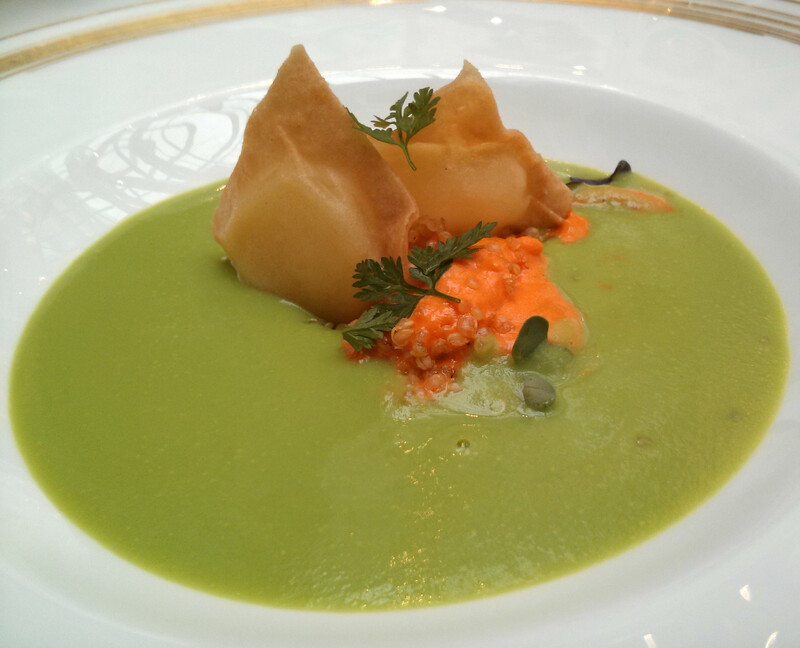 Pea Soup, fried Taleggio ravioli. Casterbridge beef, peas, broad beans. Chocolate and vanilla sphere with a raspberry heart.